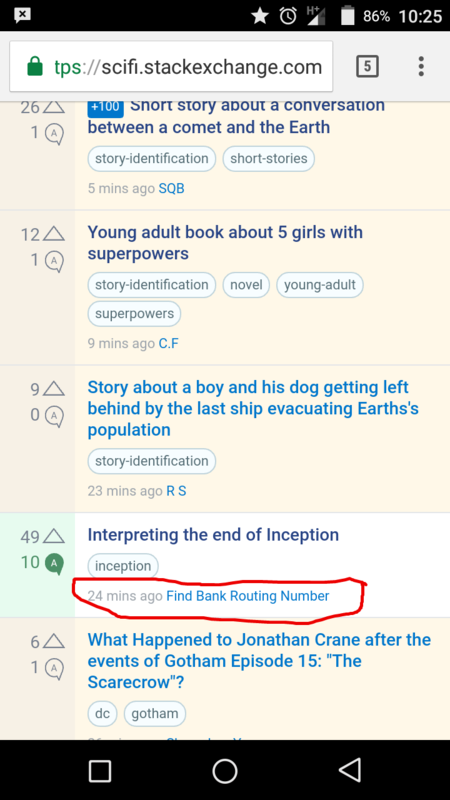 The last activity indicator currently reads something like asked/answered/modified x minutes ago by display_name, and obviously stays that way until a new activity is conducted on the thread. In the case of spam/RA posts, a lot of display names are also spam/RA. 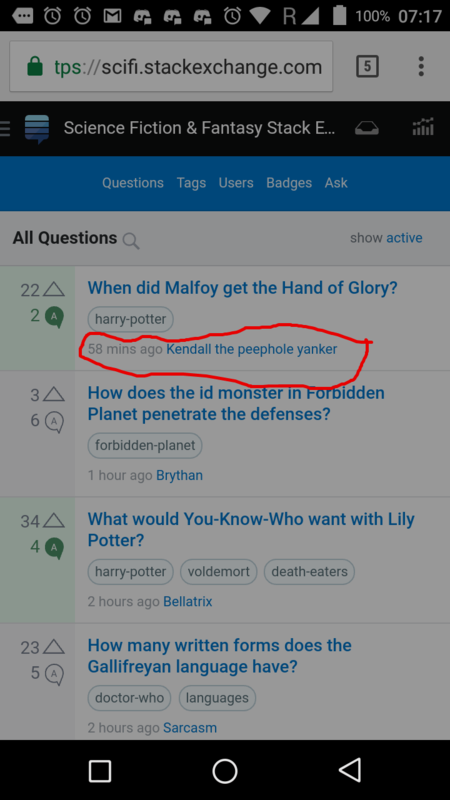 The result being that the homepage proudly features a answered x minutes ago by naughty_username, even if the post has been deleted since. This offensive username is displayed on the site's frontpage until someone deletes the account or reverts the username to default user123456 (mods can do both, I reckon). If it's not explicit enough, here are a few screenshots (NSFW): rude, spam, other rude. I understand that automatic detection/blocking of certain keywords in usernames would be hard to efficiently conduct, but maybe the username-reverting to default could be automated when someone's post is flagged and deleted as spam/RA, to avoid the homepage displaying spammy/offensive stuff? Yes, it would revert John Smith as well as naughty_username but then again if John is a random passer-by troll/spammer and their account is going to be deleted eventually, who cares about their display names then? There's a limit to how much times/period you can change your display name, I reckon. I don't know if the reverting would trigger that period? In the case of a false positive, or a true positive but user was just "unaware" and then went on to actually contribute, people might want a more custom display name than user123456 but then again, one can live with that until the next period kicks in. Of course, mods will probably see it at some point and manually do it (or someone can ping them if it's really urgent and they're around), but mods 1/ aren't our slaves and 2/ can't always be there. The true solution to this is to automatically destroy 1 rep users that have no positive contribution, and that had their only posts nukes as spam or offensive. The false positive rate is likely extremely low for spam/offensive flags if you also restrict it to 1 rep users only. So I think an automatic mechanism could work. But just going after the display name is quite a bit of work with rather small impact. Nuking the entire user would save moderators time as well, and help to clean up spam and trolls more effectively. And it would efficiently solve the problem you're addressing as well, as destroyed users are shown with a greyed out default user name. On this question I proposed omitting the username in the notification for red-flag-deleted posts. Instead of "modified 3 hours ago AbusiveName" you'd just see "modified 3 hours ago". This is also what you see for migrations where the asker doesn't have a local account -- in that case there's no account to attach to, and in the red-flag case there's an account that we don't want to give more visibility to. Auto-deleting accounts where the only contributions are spam or offensive would help, and I support that too. Occasionally we get abusive behavior from accounts that have earned a little rep first, so we should consider omitting the names on the front page when the account can't be auto-destroyed. Since your concern (and mine) is the front page, not every place the user name shows up, making this change suffices without touching the user account at all. And the user can't get around it by manually changing the name back from user12345 to the abusive name. Not the answer you're looking for? 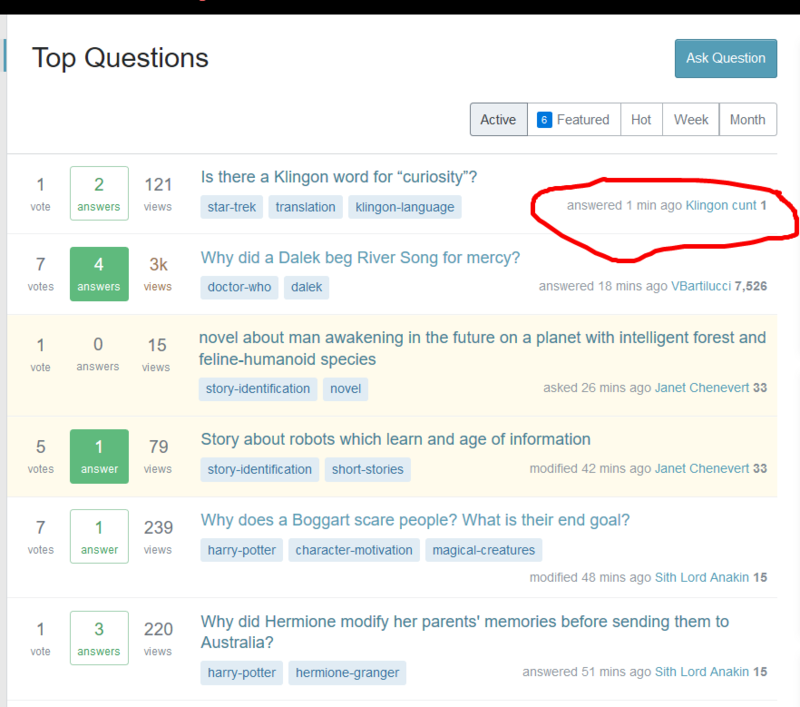 Browse other questions tagged feature-request spam display-names offensive . Would it be useful to block certain keywords in usernames?